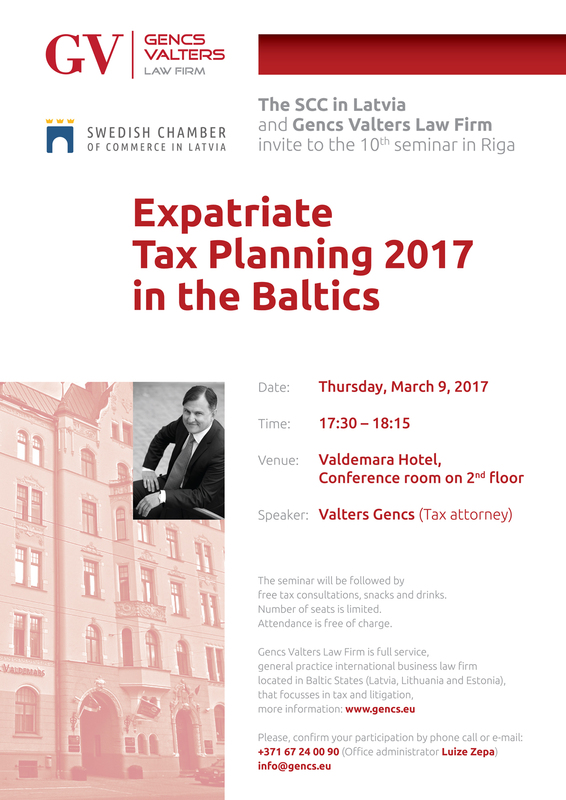 You are cordially invited to the 10th Business seminar on “Expatriate Tax planning 2017 in the Baltics“ in cooperation with Swedish Chamber of commerce in Latvia. The seminar takes place on THU, 9 March 2017, 17.30-19.00, venue: Clarion Collection Hotel Valdemars, conference room on 2nd floor. The Latvian Tax attorney Valters Gencs will give an overview and update on the latest changes regarding the expatriate tax issues, touch upon the Baltic perspective and challenges within the tax and legal environment.